February 14, 2006 | World War I. One family flees the Russians across the Alps, over the Carpathian Mountains, through Czechoslovakia, and into Vienna, Austria, where Irving Wassermann, then a toddler, starts his lifelong education in music. 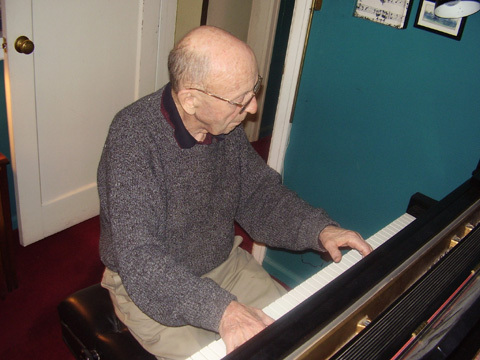 Wassermann, now a 91-year-old resident of Logan, started taking piano lessons when he was 5. The most impressive piano instructor of his youth was Professor Mierski. But Mierksi's lessons were more on life than music. "I didn't learn one thing from him technically," Wassermann said. "I learned from him to love music. I learned from him to love literature. This man made me read just by talking to me." Wassermann loved him like a father, but that's not unusual for Wassermann. He considers many of his acquaintances as good as family, if not closer. Wassermann has "adopted children" or "adopted grandchildren" scattered across the globe, from Paris, to Nigeria to China. Their pictures or letters adorn the walls and tables of his basement music studio. According to him, "I love them at least as well as my own children." Some of his "grandchildren" are neighbors. Others are former students. Many are not related, but they all call him "grandpa." At 12 years old, Wassermann wanted to become an engineer, like his uncle. Instead he continued secondary schooling, learning Latin, Greek, French, Polish, and Ruthanian. In 1937, to pacify his father he attained his law diploma from the University of Krakow. But this was not his dream. "I wanted to be a lawyer as much as I wanted to be the Pope," he joked. Wassermann continued to play the piano, but his ambition was not to play, either, nor to engineer, nor to practice law. He wanted to teach. "I always loved teaching ten times better than performing," he said. "I never dreamt of being a concert performer, I always wanted to teach." In 1938 he crossed the Atlantic Ocean and began life in New York City. But for Wassermann, life was not exactly a walk in Central Park. "I had no money," he said. "Little by little I sort of began to make a living. You can call it a living because I didn't die." He began to play with a New York orchestra. A week before rehearsal, Wassermann woke up with "fingers like frankfurters." He could not play! The hospital was not able to give him any answers, so when a friend suggested that his big fingers could be the humidity, and that he should move to Utah, Wassermann was willing to give it a try. His family, however, remained in Europe, very much in harm's way. They were Jews, and as the Holocaust began, something had to be done. His mother was able to escape to America and joined her son in Utah in 1946. His brother and sister, however, were killed by Nazis. Wassermann's dream was realized in 1955: he became a teacher at USU. During his years of teaching, he also served as department head and director of the piano program. It was during this time that he introduced the music therapy program at USU. In the 70s, he started to plan the Music West Festival. "My idea was to have a music festival because I wanted our students to learn about music," Wassermann said. When he introduced the idea to his colleagues, he said they thought he was nuts. After four years of discussing, planning, and persuading, the festival began. Now in its 26th year, the Wassermann festival revolves around performances by guest musicians, particularly pianists. They also hold lectures and workshops for those interested. It has come a long way since instituted by Wassermann. Wassermann's purpose for having the festival was to teach students to learn to play with other musicians. "I wanted the pianists to play with violinists, the violinists to play with vocalists," Wassermann said. "The only way to learn is by playing with somebody." When he retired, the festival changed hands and those hands, in turn, changed the festival. It became a spring festival deigned mostly for pianists, rather than all musicians. "I'm just happy they have it," he said. "I wish they'd make it more along the lines I envisioned. It should be in the summer." Wassermann still tries to attend the festival every year, but he doesn't play the piano very much anymore. "I've forgotten how to move my fingers," he said. But as he posed for a picture, the old pianist's hands came to life as he picked out the gentle melodies of Chopin's "Nocturne", adding in his own improvisation here and there. Wassermann lives in Logan with his wife, Mary, and they eagerly await news or visits from their children and grandchildren, even those "adopted."